A pet’s fur will help keep it warm, but only if it’s dry–a dog house with a solid roof and the door facing away from the winds provides better protection. Since the summer of 2005, Animal Services has offered “Roof Over Rover.” Using donated dog houses, the shelter provides dog houses to low-income households in need of shelter for their pets. If you would like to participate, please bring your gently-used MEDIUM or LARGE dog house to the shelter at 3120 Martin Way, Olympia, WA. If you would like to make a medium or large dog house to donate, that would be wonderful! Visit our ROOF OVER ROVER page for more information. If you need shelter for your pets, or are concerned about a pet without shelter, please call us at (360) 352-2510. Animal abuser convicted of cruelty! 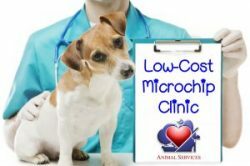 Microchip Clinic Wednesday, May 29th! We help the animals and citizens of Thurston County. Established in 1977, we are funded by the cities of Lacey, Olympia, Tumwater and unincorporated Thurston County. We operate in an 8,000 sq. ft. facility in a centrally-located site for the pets and people we serve.